I think my body must be craving oats. Last week, I made apple crisp for dessert one night, and then I posted the instant oatmeal recipe. Then on Saturday, I made these oatmeal raspberry bars to bring to a ladies’ breakfast at a friend’s home. Or maybe it had something to do with the fact that I wanted to bake, but we had no eggs in the house most of last week, and an abundance of oats. That could be why! LOL Either way, I hope you enjoy the recipe! These remind me of cereal bars. They keep great in the fridge (if they last that long!) If you don’t like raspberry, feel free to experiment with other jams and preserves! 1.Preheat oven to 350 degrees F (175 degrees C). Grease one 8 inch square pan. 2.Combine brown sugar, flour, baking soda, salt, and rolled oats. Blend in the butter using your hands, stand mixer, or a pastry blender to form a crumbly mixture. Press 2 cups of the mixture into the bottom of the prepared pan. Spread the jam to within 1/4 inch of the edge. Sprinkle the remaining crumb mixture over the top, and lightly press it into the jam. 3.Bake for 35 to 40 minutes in preheated oven, or until lightly browned. Allow to cool before cutting into bars. These look tasty–and maybe not too sweet?! Their sweetness can be controlled by what jam you use. 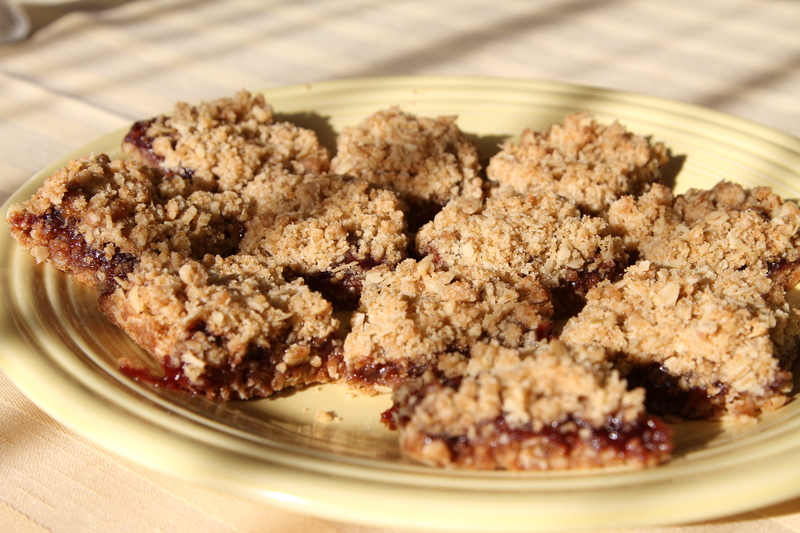 The raspberry jam adds a nice tartness to the sweet oatmeal crumble part. I like that it only calls for 1/2 c brown sugar. I almost always cut the sugar in half, with whatever recipe I’m using, and I find that the result is typically sweet enough. I agree. I usually do the same, in fact, I think I did that with the instant oatmeal mix recipe. In addition to taking out some sugar, sometimes I will try using agave or honey instead, if the recipe would work with it. These sound (and look) delicious, Becky. I was just doing some blog catch-up, then was going to look for some recipes to try for a brunch I’m having soon. Here you are with the perfect solution. Thank you. Oh, good! I’m so glad the recipe came at the right time! I just had to tell you that I made these last night for a brunch today. There is one little square left – and everyone wanted the recipe. These are so easy and so delicious. The recipe is now in my recipe file. When we do blogs, we don’t always hear when someone actually tries something we have suggested, so, I wanted you to know that you helped make my brunch a sweet success. Hey, Becky! I’ve finally found the “European connection” and answered your request to post a recipe for my low sugar cobbler. This one uses only 5 TBSP sugar, for a large 13x9x3″ pan (I kept in a little sugar for purposes of the general population), but you can cut down sugar as you dare! Hope you like it–I’ll be posting other similar recipes in the next few weeks.